Some people might face a problem when installing ColdFusion update on their Windows 2008 Server. This is because they will have to remove ColdFusion 9 connector settings and IIS6 Metabase Compatability from IIS 7. Remove existing ColdFusion connectors from IIS 7. Press Done to quit the installer. Solr Server has been upgraded. Reindex all the collections. Connector has been upgraded. 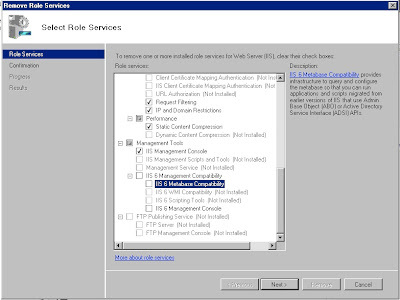 If you use IIS 6 Management Compatibility, to use IIS 7 support, unconfigure (already configured) websites. 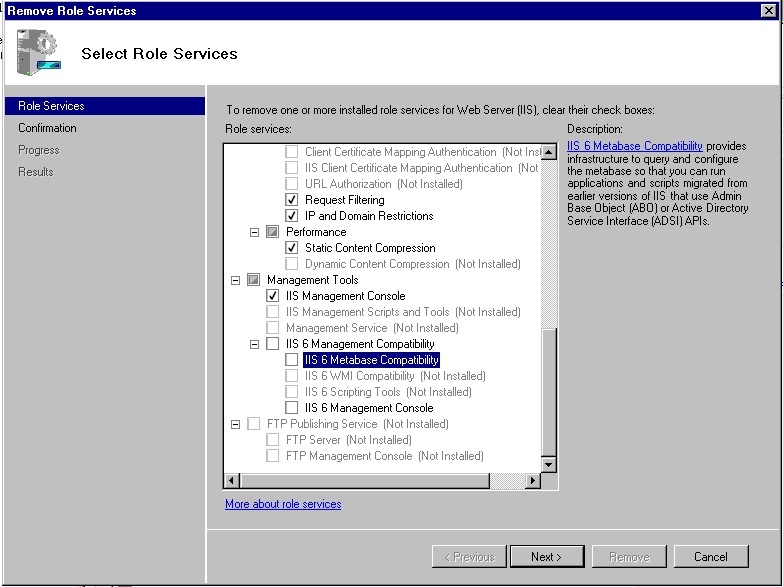 Then uncheck all IIS 6 Management Compatibility options (Start > Control Panel > Programs > Programs and Features > Turn Windows features on or off > Internet Information Services > Web Management Tools) and then reconfigure all your configured websites using wsconfig tool. Ensure that unconfiguring of the websites is done before you disable IIS 6 Mangement Compatibility options. Note that this step is not mandatory. 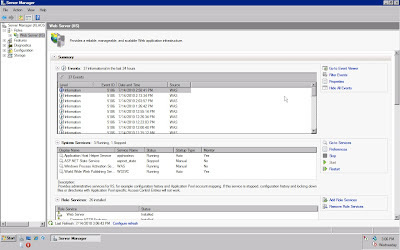 You have the option to continue using IIS 6 Management Compatibility. You will see a screen similar to the one below. The image below shows three sections: Events, System Services and Role Services. You will see a window like the one below. Uncheck, IIS 6 Metabase Compatability and IIS 6 Management Console. Go ahead and finish the removal process. When the feature is removed, you will get confirmation (may get an error - just ignore). You will be asked to restart your windows server - click yes. Once your server completes the reboot, run the WSConfig.exe under Start menu > Adobe ColdFusion 9. Select the Configure web server for ColdFusion applications option, and click OK.
Now restart your IIS7 and you're done. I hope this helps. If you face any issues, let me know. Step 1 and Steps 12-15 can incur a lot of server down time if your server has many sites on it. On the server that I'm working on it takes approximately 25 seconds to remove the connector for each site and it takes the same amount of time to add it back. I have 800+ sites on the server. 333 minutes for step 1 and 333 minutes for steps 12-15. That totals approximately 12 hours of down time on a production server. There is no progress bar for either process so you have no idea how much time it will run. Given the above time commitment, you may consider keeping the IIS 6 metabase role. From what I have read on other blogs/sites this is possible and is a much faster upgrade. 1) The Web Config tool requires ASP.NET to be installed in this mode. This means adding and running modules that you otherwise don't need (assuming your apps are all CF only). For security and simplicity I prefer only to run services/modules I need. 2) Having switched ot IIS7 support, each time you add a new website you will need to run the Config tool again to add CF support to it (unlike IIS6 mode where all new sites inherit the config). Given all these downsides, are there any compelling reasons why you'd want to switch to IIS7 native support? Correction to 1) above: it seems the web config tool in CF9.0.1 requires ASP.NET regardless of whether you use IIS6 or 7 modes. In which case I suppose you might as well go with the native support. sorry for a silly question but how do we Remove existing ColdFusion connectors from IIS 7? You can run the wsconfig.exe tool.... then choose to remove from 'All IIS website'. wsconfig is available from Windows start menu > Adobe ColdFusion. "Windows could not start the ColdFusion 9 Application Server ... services-specific error code 2"
I have checked the log file but cannot find anything??? We also facing problem but after reading your and its step we install easily.